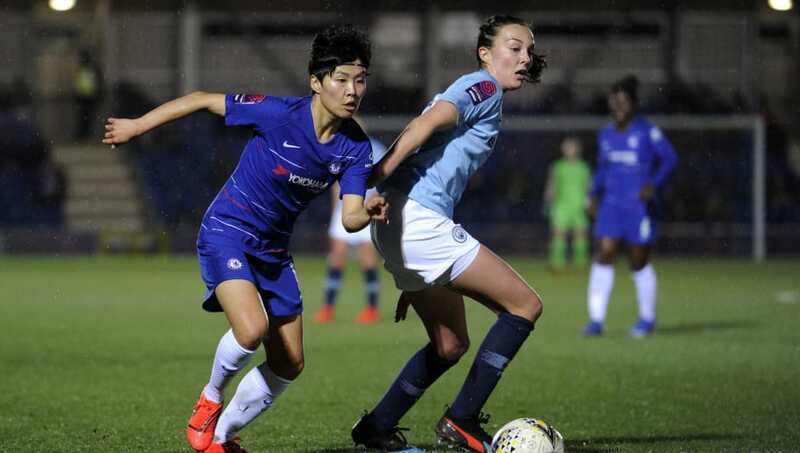 The FA Women's Super League returns this weekend with a blockbuster top of the table clash between Manchester City and Chelsea, with the game to be broadcast live on BT Sport 1 from 12.45pm. And @90min_football is inviting you to send in your questions to be answered by the BT Sport presenters on pundits after the game.  We’ll be putting YOUR questions to the @btsport presenters and pundits after it’s coverage of this @FAWSL top of the table clash! League leaders City, who are unbeaten after 14 games this season, play host to the third placed Blues just three days after the pair met in an engrossing Continental Tyres Cup semi-final, settled in City's favour by a second-half double from Nikita Parris. Sunday's clash could see City extend their lead at the top of the table over Arsenal to four points, with the Gunners not in action this weekend after their own Continental Tyres Cup semi-final tie against Manchester United. With all to play for, here are some key details ahead of this weekend's game. City have been in electric form of late, with Nikita Parris' two goals in Wednesday's cup win over Chelsea the seventh and eighth goals in her last six outings. The WSL table toppers are yet to taste defeat in the league this season, having won of 10 of their opening 14 games this season. They have scored 40 goals so far, and have conceded just eight times - helping them to establish a single point lead over Arsenal at the top of the table. Chelsea, meanwhile, will look to bounce back from their cup defeat to City by returning to winning ways in the league - though their most recent league outing saw them slip to an unexpected 3-2 defeat at home to Birmingham. The Blues have been more circumspect in front of goal then their opponents this weekend, but still find themselves within touching of the title race - sitting just six points behind their rivals.  Next up... a double header!